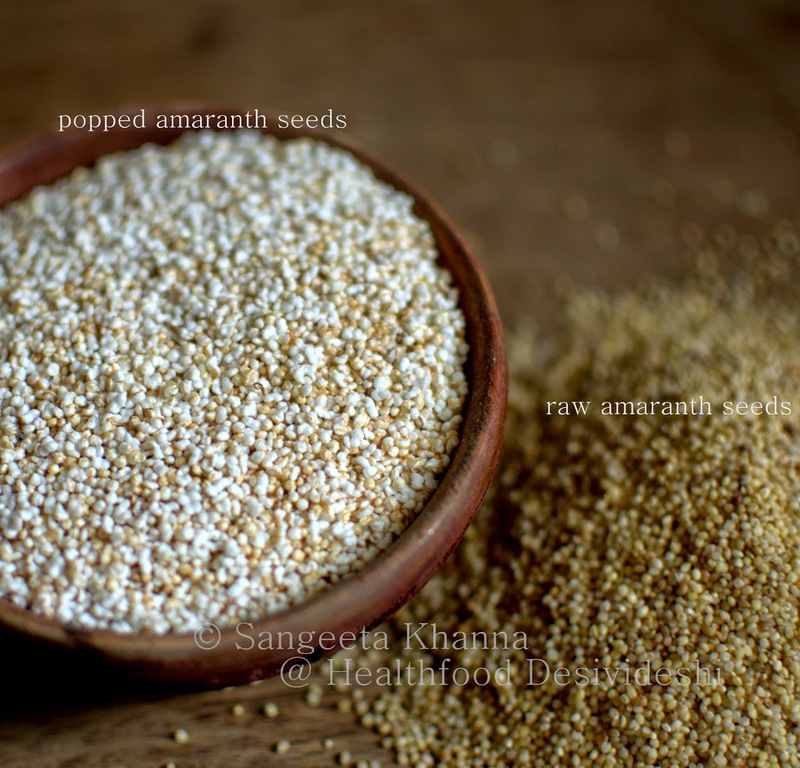 Amaranth seeds are called Ramdaana in Hindi, we used to have Ramdaana laddoo in our childhood so I was in an impression that it is an Indian grain (pseudo grain). It was later that I found out that the grain was a traditional food for the ancient Aztecs of Mexico and is still a traditional food crop in Africa. This grain has been considered kosher by Hindus as it is used for religious fasting and also as an offering to God (prashad). Amaranth can be the future food crop owing to the rich nutrients it has and the ability to withstand arid conditions. Don't you think the farming lands will be more and more arid in the coming years? It is a gluten free grain that cooks quickly. You would be glad to know that Amaranth seeds have more protein content than quinoa, the much touted healthy grain that is helping people make huge carbon footprints. While quinoa has 8.1 gm protein per cup, Amaranth seeds provide 9.3 gm protein per cup. The essential amino acid Lysine which is missing in other grains, is found in Amaranth in good amounts. Rich in Magnesium, phosphorus, potassium, zinc etc, low on sodium so it makes a good grain substitute. I would rather say a good cereal substitute if you are dependent on cereals for your breakfast. The popped amaranth seeds are very interesting as it can be used in a versatile way. The raw grain can be coked like rice using 3 parts water to one part amaranth and used to mix with milk or coconut milk to make your daily porridge. It can also be popped at home to make tasty no cook cereal. Here is a how to pop amaranth at home tutorial. We get popped Amaranth in markets during fasting season, I buy it in bulk in such times. We love it with milk or with coconut milk. 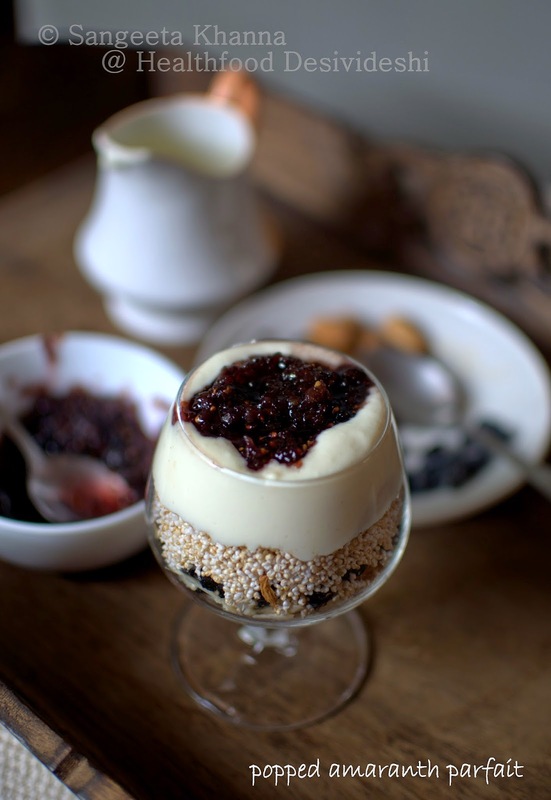 Here is one easy parfait with popped Amaranth seeds. 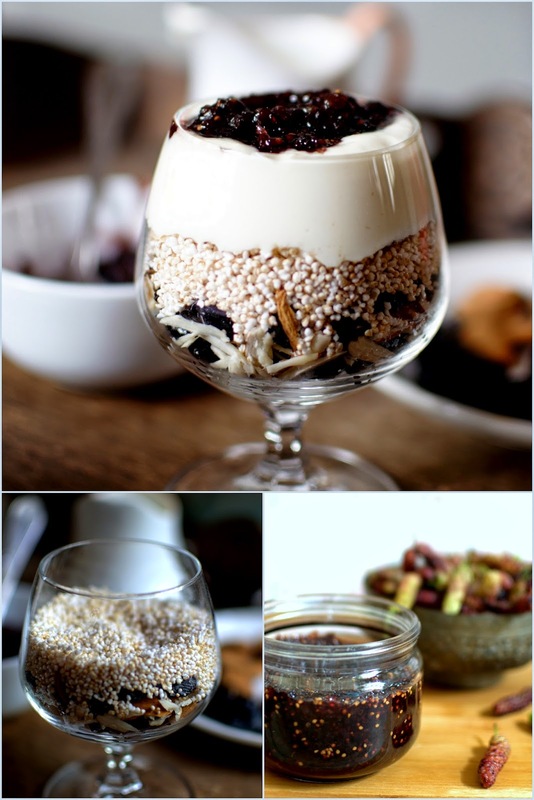 Just layer chopped dry prunes, golden and black raisins, chopped almonds, popped amaranth seeds, hung yogurt and top the parfait glass with a fruit preserve of your choice. I used a homemade Mulberry preserve. Use strawberry or raspberry preserve or even fresh cut fruits. We love mangoes with it too. You notice that there is no sugar added to this recipe. The fruit preserve has minimal sugar in it. 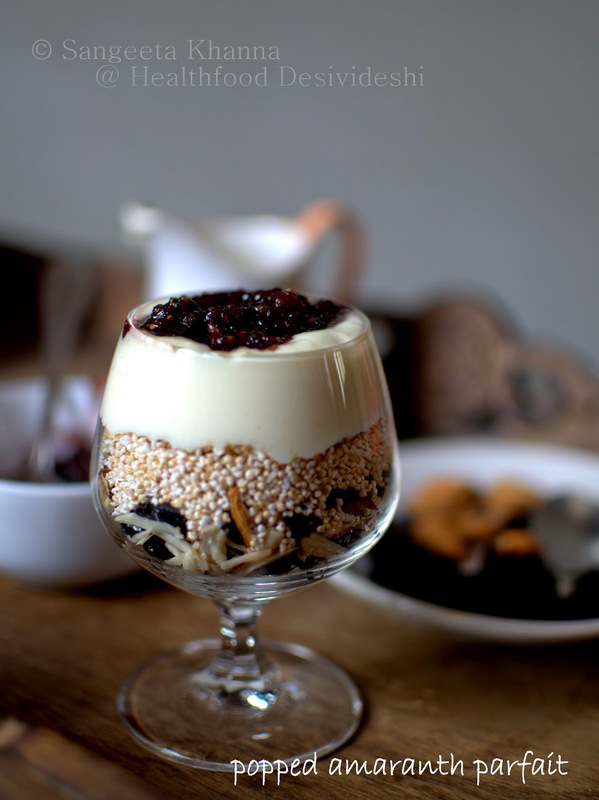 The crisp popped amaranth seeds are a nice contrast to creamy yogurt and chewy raisins, prunes and almonds. I love this combination and the husband also likes having it for breakfast. Mostly we just plonk everything in a cereal bowl and have it after lightly mixing it. I layered it all into a glass for you all to see. Keeping some extra nuts and dry fruits on the side is useful as you might like to add on something or the other. Don't forget it makes a filling breakfast meal and keeps you full till lunch hours. A quick and delicious parfait! I love the way your photographs are coming out...just gorgeous. This parfait is gorgeous too. Wonder if I will find popped amaranth here? Want it!! Nice to learn a history of amaranth, that I lately use quite often. Most of the time in my homemade cereals. I have never liked it much.. they feel like thermocol in the mouth! But after seeing the pictures, feeling like giving it a try again :-) do we get it year round in Delhi even when its not navratras? 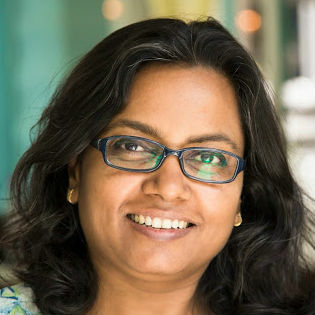 your pics are delicious sangeeta. thanks for dropping by. i have mulberry preserve and will try this way. still to try cooking the amaranth and adding them to food. did you get my comment or it disappeared?? ?